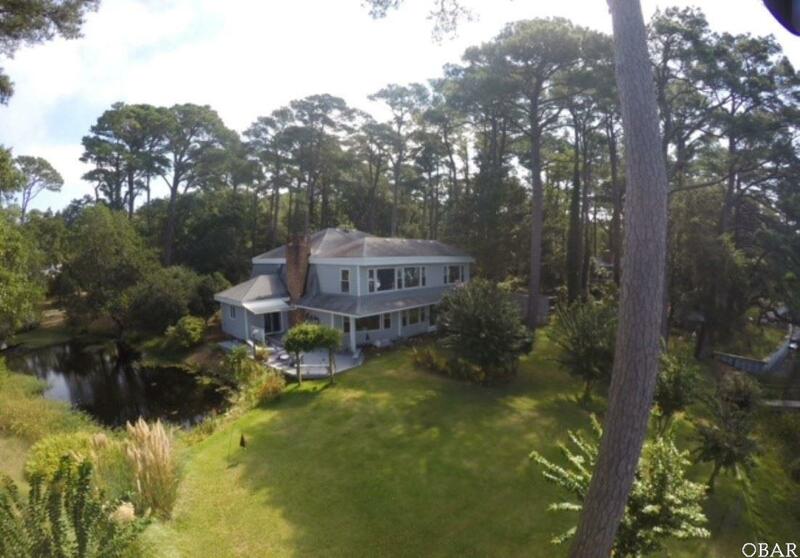 This unique home is located on one of the most beautiful and largest sound front lots (1.3 acres) in Southern Shores. Come enjoy a cocktail and this sunset at one of the most gorgeous settings on the Outer Banks. Conveniently located near the main Southern Shores Marina. This lot is a must see to captivate its tranquility and beauty. It is truly a view of Heaven. This waterfront beauty has 5 bedrooms, 3.5 baths and 2 car garage. This home offers nearly 4,000 square feet of living space with exceptional craftsmanship. Home was remodeled in 1999 to add additional living space for entertainment and to accommodate family and guest visits. Kitchen is fully functional to accommodate those family dinners and entertainment events. There's plenty of space for together times and private retreats. Ground level living with bedroom and bath with a separate entrance that could be utilized as that perfect Airbnb destination or an in-law apartment. Enjoy ground level living with a Florida room and step into your large hot tub to soak away your worries from the day with a glass of wine. The large yard has a pet friendly invisible fence so your animals can explore and enjoy the property providing you peace of mind. Take a walk on property's large dock and grab your kayak or paddle board and explore nature at its best. What better way to end your evening watching spectacular sunsets in the glory of your private secluded home. Both ground and upper level have gas fireplaces so you can have outside glory and cozy glory inside. To enjoy the Southern Shores Civic Association amenities (Voluntary), there is a $50 per year annual charge for the usage of all three sound side Marinas with boat launch and picnic and crabbing areas, access to community of Southern Shores beach accesses and multiple walking and bike paths. Join the SSCA tennis for a small additional fee. Call today for your showing of this beautiful View of Heaven !!! Listing courtesy of Donna Cooke of Atlantic Realty.